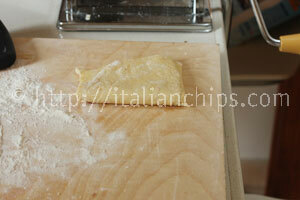 I was postponing this how to make pasta post for no special reason. 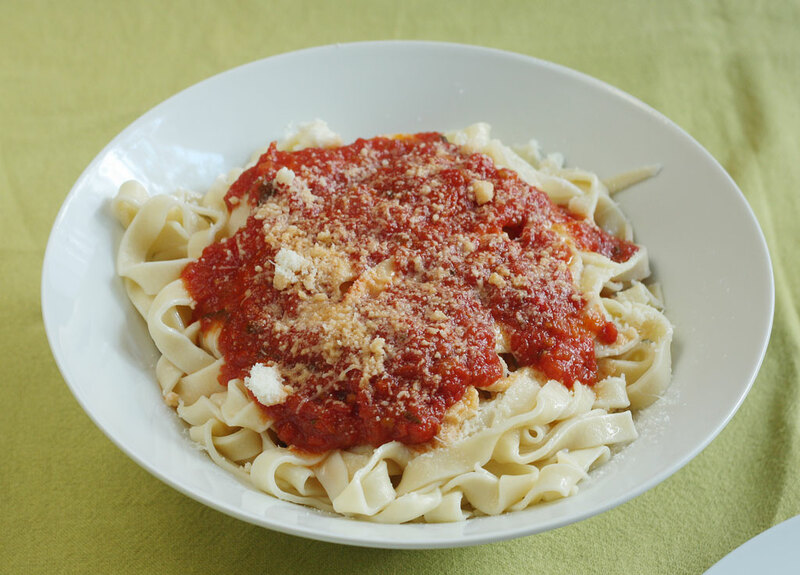 But yesterday I just felt like it was time to make pasta and post about it for a special reason (this recipe was originally posted Nov 22nd 2013). I live in Olbia, Sardinia, a city that was devastated by an inundation last Monday. I was lucky enough to live in a zone that was not touched, but there were 16 deaths and there are a lot of people who lost their houses and belongings. It is a huge blow. I’ve been helping friends who had 1,5m of water invading their house. The water power was so strong that put down the exterior wall and the double door at their entrance. It is something that touches our hearts. My friend slowly began to find her youngest son school bag covered with mud, their marriage certificate, their shoes, everything. They are lucky enough to have great friends who lent them an apartment. But there are so many other families who are destined to live the whole winter in their wet houses. It is a sad event that is signing everybody who gets in touch with it. The good news is that there is so much solidarity. Groups of young people helping friends and all the city is working to re-emerge from this drama. 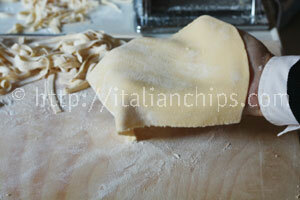 That’s why I decided to post about how to make pasta. 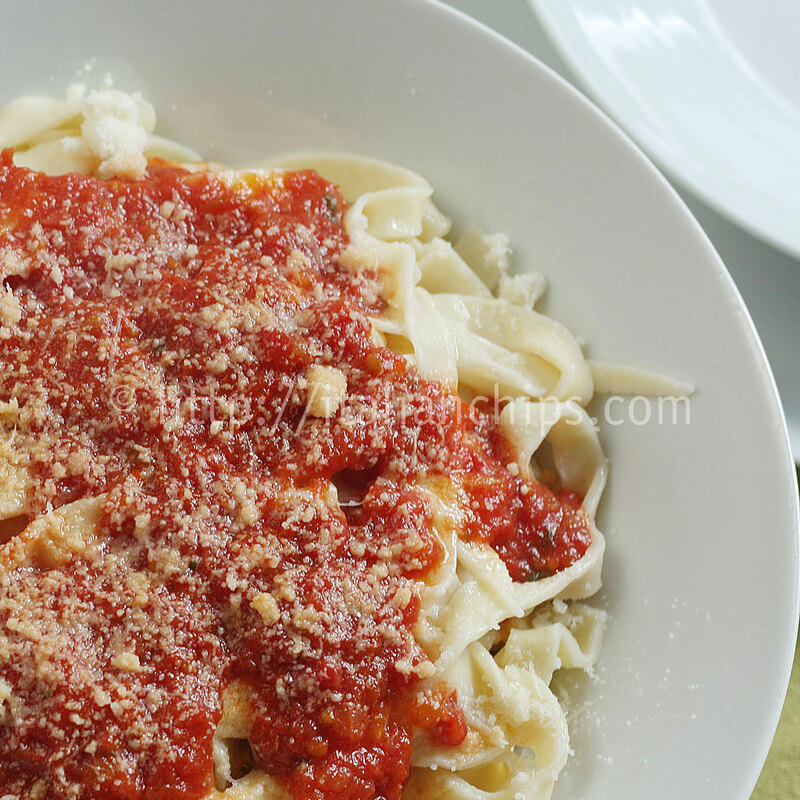 I prepared it yesterday as a symbol of home, of warm inviting and comforting food. 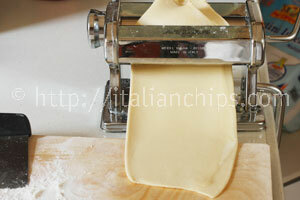 Fresh homemade pasta is the symbol of Italian familiar food. I dedicate it to all Olbia families that are now facing a difficult moment, wishing them the quickest recover to their homes and daily life. It is easy to prepare. I took a photo of each step (see below) so you can do it with me. 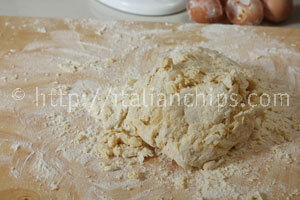 Prepare 500gr of hard flour, in Italy called flour 0(zero) or Manitoba (it is the same used for pizza). 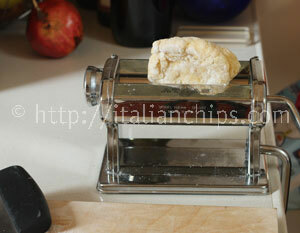 You will need a pasta machine as it is pretty hard to prepare it all using just your hands (even if the old ladies use to do this way ;-D). 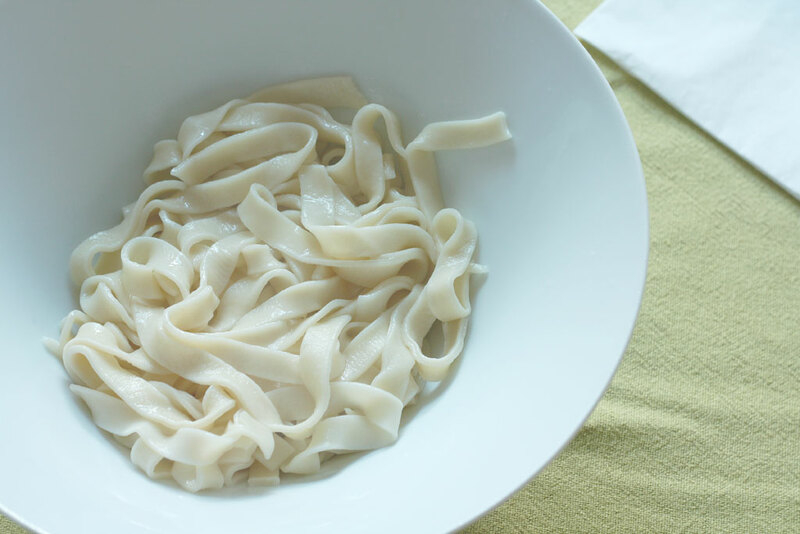 100 g of fresh pasta is a generous portion for 1 person. This whole recipe is for 6 people. Dress as you want. 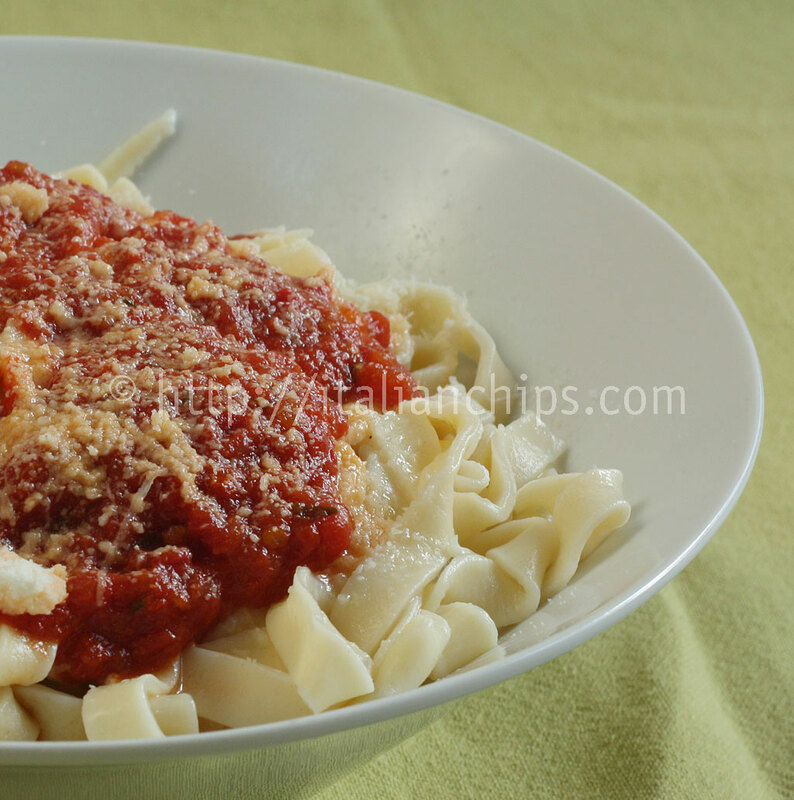 I put some pasta into a bowl, added abundant grated Parmesan cheese and then tomato sauce. 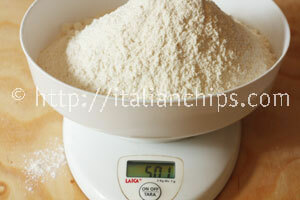 Prepare 500 g of hard flour, in Italy called flour 0 or Manitoba. 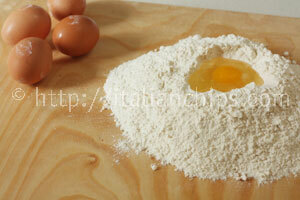 Take 5 eggs (1 for each 100 g of flour) and make a hole in the middle of the flour pile. 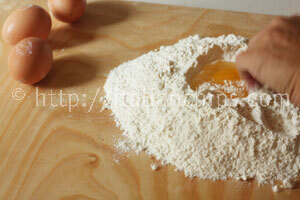 Begin adding one egg at a time and mix it with the flour around it using your fingers. 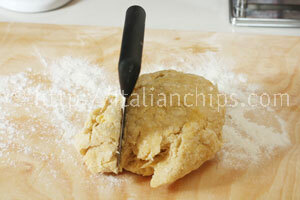 You will get a rough dough. Add little water if needed. Nobody can say if you’ll need it or not. It depends on the humidity of the air and the size of the eggs. I added something like less than half Tsp. Add really little quantity at a time. When it is well combined, cut in in portions. 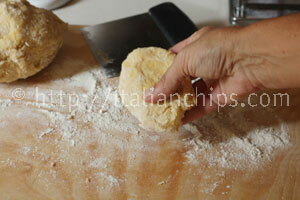 Flatten each portion using your hands. 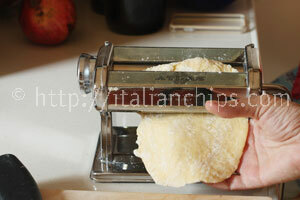 Using a pasta maker, begin to work the dough passing it through the thickest number. Repeat it for three or four times, until it becomes homogeneous. 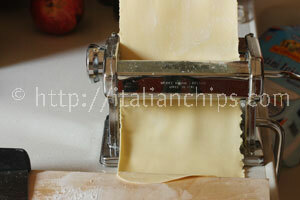 Then change the thickness to thinner, but not too much – go ahead of 2 numbers on the regulation of the pasta maker. 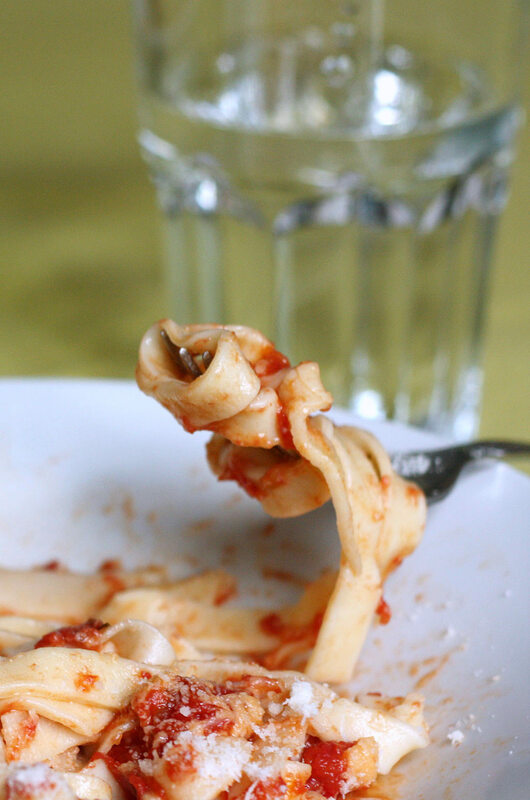 The pasta will become thinner and longer. 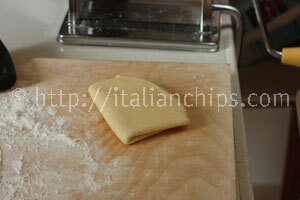 Cut it in two and then pass to a thinner thickness. 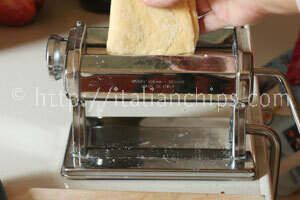 I have an old pasta maker and I finish it with the regulation between 5 and 6. 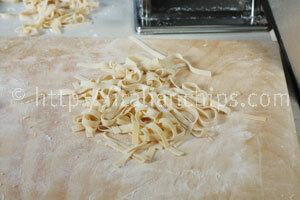 If you don’t have a pasta drier (as me), add flour to both sides of the dough before cutting it in tagliatelle. 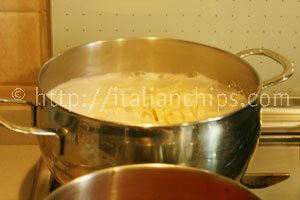 It will avoid the pasta from attaching with itself while drying. 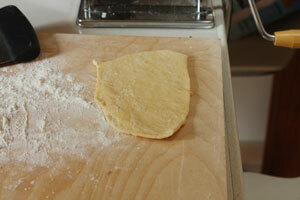 Let it dry a little over a floured surface. 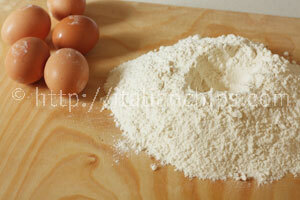 At this point you can put it on a floured tray and put infreezer. When it freezes transfer to plastic bags and defroze putting them directly into boiling water, when you decide to when you have unexpected guets for lunch or dinner). If you want to eat it immediately, as I did, just put the quantity you need into salted boiling water and boil until it is done (you have to take a piece and taste, as there’s no specific cooking time in this case).